TAKING OUT TOP SPOT: Winner Joe Allen, from Elders Euroa alongside runner up Joshua McDonald from SKB Rodwells Warrnambool. JOE Allen of Elders in Euroa has come out on top of the 2018 ALPA Victorian Young Auctioneers Competition. 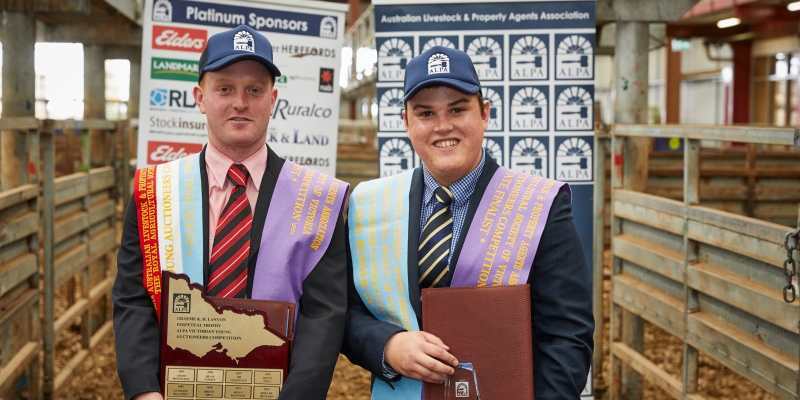 Mr Allen came first place in the competition held in Pakenham recently, which showcased the auctioneering talents of stock agents from across the state. Going into his second year in the competition Mr Allen wasn’t going in with any expectations just to have a good day and sell his lot. “It was tighter competition this year compared to last, so there was that added pressure,” Mr Allen said. Coming out on top, Mr Allen said he felt being clear in his speech and getting incredibly close to the asking prices were the elements that helped him along the way. “I sold three lots and was able to get within five cents of one lot and one cent of the other so that was really good,” he said. Having competed for his second year in a row, Mr Allen recognised that he could see growth in his skills as an auctioneer over the two years competing. “I just like to go into the competition with an individual take on things,” he said. The determined competitors were judged by three livestock agents who were selected based on their industry experience and strong selling backgrounds.